Submission is tactical in the UFC, but quitting is never an option. Members of the Torrance, California, UFC Gym don't know how to quit. Scope this incredible location! The Ultimate Fighting Championships place two men in an octagonal ring and ask each to knock the other unconscious or force him to submit through intense pain. The five franchises making up the UFC gym market themselves as a public alternative to the brutal sport. The athletes in the UFC have incredible physiques because they work their bodies in unique ways. If you want that type of body, you can get there by training like a UFC fighter. UFC Gym Torrance never closes. Its trainers are always on hand. You don't have to be a fighter to be a member, but you must adhere to the sport's training methods. This unique facility adds to the growing culture of MMA around the world. 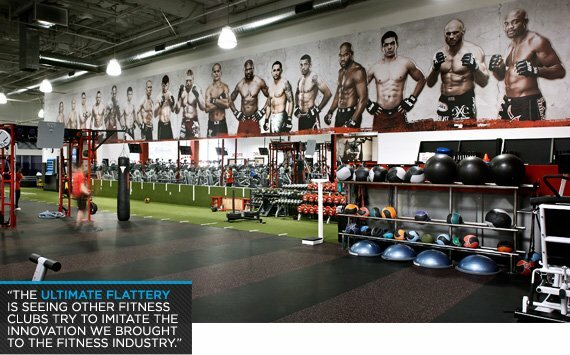 Congratulations UFC Gym Torrance, the August Bodybuilding.com Gym of the Month! 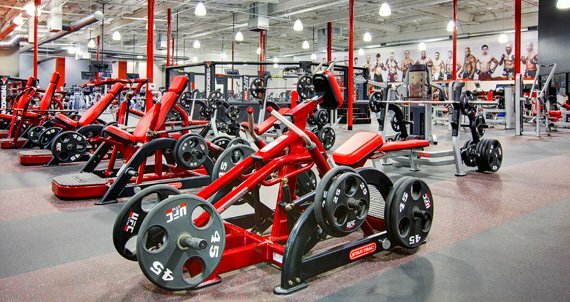 How did the gym start and why did you decide to get into the gym business? UFC has grown tremendously over the last 10 years. It's one of the fastest growing sports in the world. This growth is a testament to the company's leadership, the increased understanding of the sport, and the incredible talent, ability, and dedication of these athletes. Mark Mastrov and Jim Rowley, founders of New Evolution Ventures (NEV), are also long time UFC fans, and through an introduction met Frank Fertitta, Lorenzo Fertitta, and Dana White, owners of the UFC. As UFC continued to grow, Mark and Jim saw the demand and the potential to offer the innovative training techniques of these athletes to the traditional fitness consumer. It was important that we created a gym that would showcase the way a UFC athlete trains and to have a facility to provide the amenities and services to support this unique way of conditioning. Every one of our clubs is built in a way to drive interactivity between the member and customer, allowing us to develop a place not just to train differently, but truly have an experience that is unique in the fitness space. This concept took years to create and develop and now members of all profiles can benefit from the unique services at UFC Gym. Our motto is "Train Different." We combine the best of traditional fitness with the innovation of MMA. Not only does mixed martial arts have incredible physical benefits, it also adds an intense, empowering, yet fun aspect to working out, all of which are provided at each and every UFC Gym. UFC Gym is not just for the UFC and MMA fan; it's truly a workout facility for the entire family. We have an Octagon and extensive MMA training, but we also offer pilates, indoor spinning and an array of youth programs. All fitness levels and types are encouraged to find motivation and results at UFC Gym. Our members are motivated by the fact that we offer the workouts and lifestyle that have proven successful for the world's most elite UFC athletes. We've also created a community that provides our diverse members motivation, fun and most importantly results. Who are your top trainers, and why are they so good? Tony Fryklund - Veteran UFC Fighter and coach with more than 20 years of experience. Bryan Popejoy - Muay Thai champion and world famous coach, both in Thailand and the U.S.
Mauricio "Tinguinha" Mariano - Head BJJ Instructor, 4th degree black belt under Master Carlos Gracie, Jr.
Master Carlos Gracie, Jr. - Taught in Brazil, Japan, and the U.S. for more than 15 years. We have 13 trainers total, who are all NASM certified. In addition to extensive MMA programming such as Muay Thai, kickboxing, Brazilian Jiu Jitsu, women's self-defense and team-oriented Daily Ultimate Training, the club also boasts a UFC Kids Gym, a private kids training area, offering Youth Fitness Classes, Active Fitness Gaming, Youth Mixed Martial Arts Training, and Ultimate Birthday Parties. 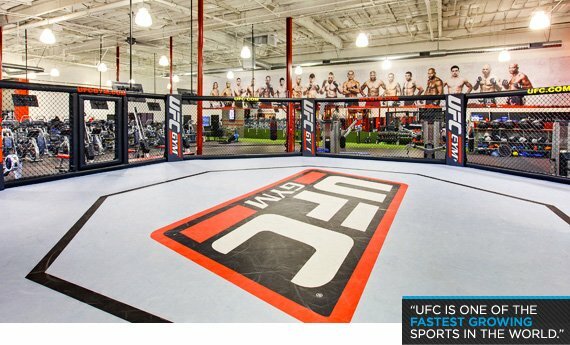 The facility, which is open 24 hours, also offers UFC Gym-branded retail and an arm bar for members to refuel and refresh after their workouts. Getting our concept out to the entire community. The ultimate flattery is seeing other fitness clubs try to imitate the innovation we brought to the fitness industry, but a few speed bags cannot compete with the environment that our team created. The difference is that our "Train Different" philosophy is in our DNA and has proven to deliver incredible fitness results while empowering skills. According to the UFC, UFC Gym has become an extension of the UFC brand, reaching not only the UFC fan, but classic fitness enthusiasts. We see people get in the best shape of their lives while their self-confidence improves, positive mental attitude changes, and overall outlook on life gets better as a result of what they learn within the four walls of UFC Gym. For us, success is measured by the customer and the community around our facilities. 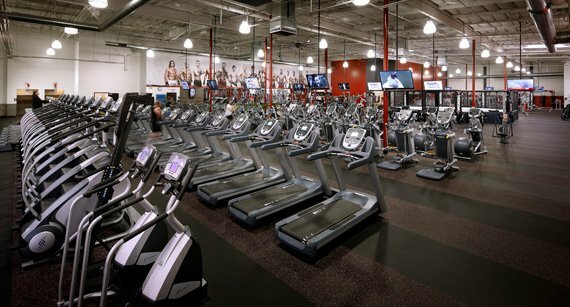 When you look at the UFC Gym's club connectivity, class participation, overall atmosphere and social media following, the model is a unanimous decision. Want More of UFC Gym Torrance? Check Out This Exclusive Video Interview With The Crew From Expendables 2, Shot In The UFC Gym!